Harvest 2010 occurred on October 30 in the very early morning under an overcast Napa Valley sky. We had just one heat spike in August but otherwise, the summer was a relatively cool one. We are quite thrilled with the 2010 vintage as the wine shows a bit on the softer side than previous vintages and yet it has a solid tannin structure. Our Cabernet Sauvignon is drinking beautifully today and it will continue to age over the ten to fifteen years. Our estate grown 2010 Kelleher “Brix Vineyard” Cabernet Sauvignon has a deep dark ruby color with bright fruit forward aromas of Bing cherry, spice chocolate and coffee. The tannins are smooth yet firm, which makes this wine wonderful to enjoy now but know that it, will age and mature beautifully. The wine is balanced yet concentrated with a smooth richness on the palate. We are now offering our 2 bottle wood box perfect for gifting or your wine library. Click here to find out more. 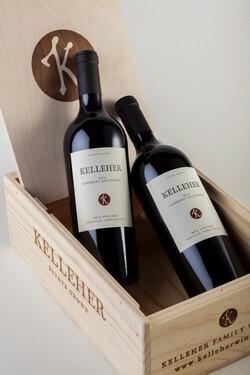 Tasting Notes Our 2010 Kelleher “Brix Vineyard” Cabernet Sauvignon has a deep dark ruby color with bright fruit forward aromas of Bing cherry, spice chocolate and coffee. The tannins are smooth yet firm, which makes this wine wonderful to enjoy now but know that it, will age and mature beautifully. The wine is balanced yet concentrated with a smooth richness on the palate. Production Notes Grapes are cold-soaked in stainless steel tanks and then fermented with wild yeast. Once fermentation is complete, the wine is warmed up to 100 degrees and the pumped over once a day for five days. The tank is then drained over night. Aging takes place in 50% new and 50% once used French Oak for 24 months. The wine is lightly fined with 1 egg white per barrel. Food Pairing Notes Our big bold Cabernet Sauvignon will stand up well with Ribeye, Blue Cheese, Filet Mignon.